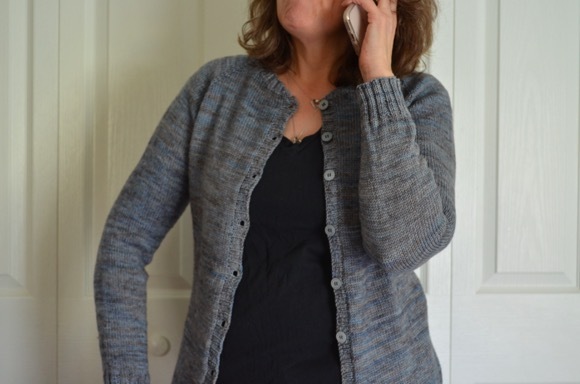 Did you see my finished shawl? I am toe tapping impatient to wear it. For some reason we have a heat wave occurring to snafu my plans. Patience is not one of my virtues. I'm still knitting these socks and my other shawl. I recently watched the movie Little Women starring Winona Ryder and instantly had an urge to re read the classic. The last time I've read this book was in my teens. While reading, I'm transported to another time and place. I was around 13-14 years old and just discovered how reading could be fun instead of drudgery. After that discovery, I spent a summer on the front porch swing with a glass of iced tea and many many books-along with a pen and paper creating the "list of books read". I was quite proud of that list. Hooray! Now I can talk about Christmas knitting right. It's hot here too and I am just plain tired of it. I want this cold, cold winter I keep hearing about to hurry up and arrive. I just had my hand on Little Women and then put it back. I haven't read it since I was about 13 either so I am curious as to what I will think about it now. It was starting to get to be fall weather here in CT...then the heat came back. Ugh! Still working on my Minion and not much reading to be had. 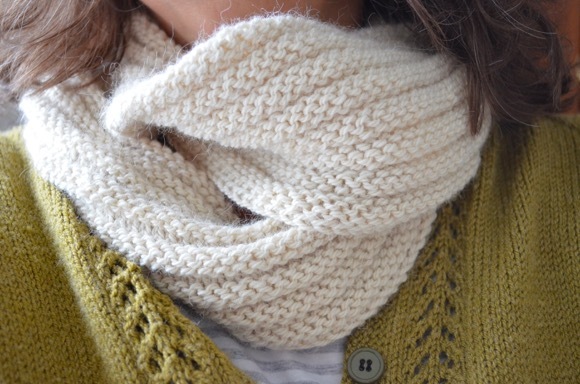 Hooray for getting your holiday knitting on! Love the shawl you chose. Little women is such a fun book to return to, isn't it? I've been eyeing up the movie on netflix this week. Yay for Christmas knitting - now I'm not the only one! I've been planning my Christmas knits for a while.......it's never too early to start. 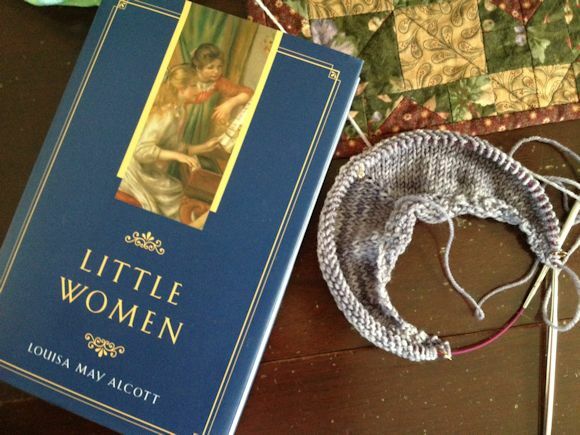 I love the book Little Women, although I prefer the older version of the film with the young Elizabeth Taylor, I think it was made in 1948........beautiful start on your Christmas knitting shawl. I'm told that you will have appropriate shawl weather this weekend. I believe it's going to get chilly! I need to do some Christmas knitting right after I get done with this sweater. I love that movie version! It has nothing to do with Christian Bale, I swear ;-) I need to get started on my Christmas projects... but most of the yarn is waiting at my parents' house and my sewing machine is buried. I really need to work on that. I hope for some cooler weather soon to enjoy your knits! Christmas knitting? Already?? I would die! Haha! Doesn't help that it's so hot here, I guess. Kate was bugging me to work on her mittens for the snow today... I had to tell her "Ain't gonna happen!" It's too hot to knit thrummed mittens! I loved that movie and of course the book. I watched that version so many times as a girl that IT immediately transports me back to days that I was in love with Christian Bale as Laurie. Beautiful yellow shawl, and the gray looks like it will gorgeous too. I may have to dig out my copy of Little Women again. that yarn is a lovely colorway. that is going to be a great shawl. i remember lazy summers as a kid spent reading. I share your excitement for holiday knitting - I, too, have begun. :) Little Women is a favorite at our house. Good book and movie, I think. holiday knitting- you are so good! I LOVE little women... it had been ages since I have read it! Eep! I haven't even thought about what to knit for the holidays yet! Little Women is a favorite in our house. With 4 daughters I had my own little women! We watched this year after year and it is still a favorite Christmas movie! aaaah I just know you are going to enjoy the re read. Jo's Boys was my favourite. WOW Christmas knitting already, wish I was so organized. When my girls were young we would watch Little Women every Christmas season----loved it! Yay! Christmas knitting! It's never too early to begin. Little Women is one of my all-time favorite books. Oh my, I loved Little Women as a teen, should pick it up again. I am not sure if I have read Little Women or not, which is probably a crime. I'll add that to my list. I love lists--and Goodreads is fabulous for me. I've started one thing for Christmas, but then it got set aside for a project for myself :) I love the color. The first thing I thought was "holiday knitting already"? But then it hit me, it is almost the middle of September and if I do want to hand out handmade gifts, I need to get moving! We had a heat wave last week. This week we've had fall weather and slow moving rain storms. Had I not been at work I would have been home knitting! I have a binder of printouts of books that I want to read. It's a family obsession to read books in the correct order and my binder kind of helps me keep track. I've had a lovely read of your last few posts and admiring all your knits. Are you going to knit anything for Halloween? I've seen some wips for that but I won't be joining in. I think I may get knitting for Christmas soon though, get some gifts in the bag, so to speak. Good ol' Winona. I always feel sorry for her when I think of her. But, I didn't know she was in Little Women! Never read the book either, but it will be something that I read to the girls at some point. Nice! You're thinking of Christmas! YOu'll be way ahead of the game. Ohhh I love Little Women!! I haven't read it in years. I should get out my copy. I can't wait to read it with Ree! I also love the movie version of it with Winona Ryder. I started my Christmas knitting a few weeks ago too. With baby coming so close to it I figured I'd better start now! Although it is HOT here again so I don't want to knit with wool. Well I do, but not in the heat. I want Fall!!! Good for you getting started on holiday projects! It's funny, Little Women, has been calling to me also. I didn't know there was a relatively recent movie? I just finished Dreams of Joy, the sequel to Shanghai Girls..a very sobering read. Oh I love the Little Women story! It's amazing how books can sweep you off to a different place.